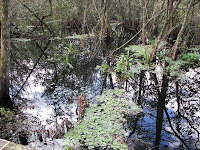 The National Audubon Society manages a wetland preserve east of Naples - Corkscrew Swamp. It has the largest remaining stand of ancient bald cypress trees in North America and is teaming with birds and other wildlife. 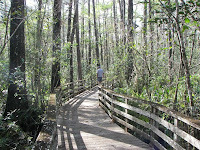 There is a 2.25 mile boardwalk through the preserve which Bill, Beth, Warren and I explored on Friday. As we headed out, Warren spotted a Bald Eagle circling high above the trees. We also spotted several Red-shouldered Hawks but the most exciting sight for me was a small Pileated Woodpecker - the Woody Woodpecker bird! He was too quick to get a picture - but I definitely got a good look. Yes, he looks just like Woody! This tree looks like it has another tree growing out of it. The second tree is a strangle fig. The roots look like vines growing up the tree but they are actually growing down. The fig fruit is a favorite of the birds - especially the Pileated Woodpecker. 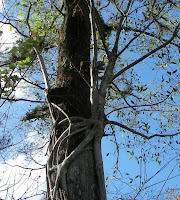 It does not actually strangle the host tree but can kill the plants below by blocking the sun with its dense canopy. 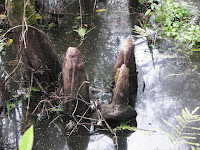 These are cypress knees and are seen throughout the swamp. 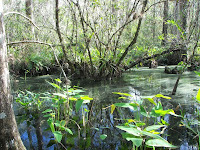 They are part of the cypress trees' root system and do not grow up to be trees. They help anchor the tree and supply a home for other plants. 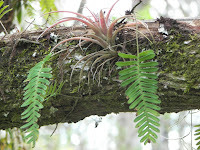 The original hanging plant - air plants look like they are parasites but actually do not harm the host tree. They get all of their nutrients from the air and rain. In corkscrew there are twelve different species of air plants, each related to the pineapple. I was fascinated with them! 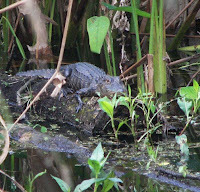 We spotted this small alligator as we walked along the boardwalk. He was about four feet long. This is Lettuce Pond. The reflections were beautiful. 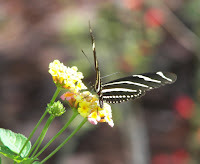 This butterfly is a Zebra Longwing that lives in the butterfly garden at the entrance to the sanctuary. We enjoyed our visit so much that Bill joined the National Audubon Society. Now we can take all of our visitors to the sanctuary at no additional cost.